Johnny has toured every state in the continental US, as well as Canada, absorbing the Blues first hand playing up and down the Mississippi delta. Johnny formed the blues band 'De Delta Dawgs', with members of 'Canned Heat' and 'John Lee Hookers' band and went on to play 'Bluestock' a major Beale Street festival in Memphis, the Memphis Blues Festival, and many clubs along world-famous 'Beale Street'. 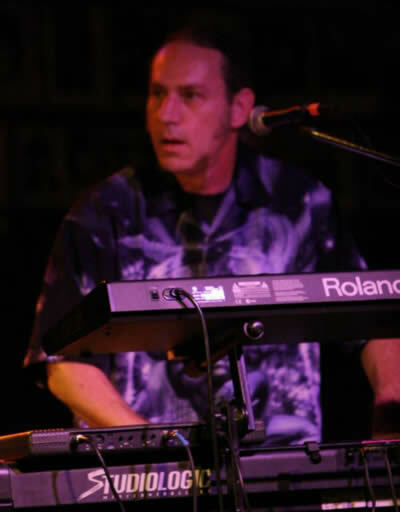 Credits include an appointment as the keyboardist and musical director with the national act 'The Bobby Freeman Show'. You can catch Johnny Blue tickling, manhandling, and shredding the ivories with The Boxcar Blues Band, The Hot Pursuit Band, Girl In The Middle, Midnite Blue & Chickenwire, as well as the international Reggae Band 'Rascalin & The Roots Rockers', with whom he has toured extensively, most notably headlining the 'Annual Bob Marley Festival Tour' series. His preference and love for playing acoustic piano and the Hammond B3 with Leslie serves his love for the Blues well. He played his first licks when he first heard the magical stylings of early boogie-woogie greats coming from a player piano his parents purchased when he was four years old. He was fascinated, enthralled and hooked and he never looked back. Though trained in theory, he mostly learns and plays by ear. His love for music encompasses many genres, but formatively he cut his teeth on blues based rock. His stint in Memphis and the Mississippi Delta was a purposeful journey to absorb all that makes up the history of Delta Blues. An accomplished vocalist in his own right, with The Blues Counts he adds tasty harmony vocals that ice the cake. Prefering to play standing, he moves and connects with his audience, loving every second he is graced to be on stage.